Still, the disinformation outlets continue to attempt to depict the illegal land-grab as something noble: “Everything is fine, everything is perfect” a Crimean is quoted, adding “We have enough money!”, thus contradicting the famous words of Russia’s Prime Minister Dmitry Medvedev – “There is no money, but hang in there!” Yes, one might need some hanging-in-capacity as the prices of produce have spiked 203% since the illegal annexation; for municipal services – with 205 and for health care with 168%, all according to official Russian statistical data. Well, if the disinformation on Crimea is gawky and inelegant, maybe we can find some less ungainly stuff among other topics? Well, the Russian Katehon.com website calls Pope Francis “a communist wolf disguised as a lamb, who serves as a lackey to his Zionist masters” because of the Catholic Church’s decision not to oppose an exhumation of late Spanish leader Franco. Other powerful leaders receiving praise this week are Nicolas Maduro, who defends his country against Western saboteurs and Donald Trump, who is cleared from all accusations of collusion with Russia. On the other hand, western men are generally described as effeminate, but, despite their lack of manliness, remain a clear and present danger to Belarus. The terror attack in Christchurch is, with a sad inevitability, taken up by the pro-Kremlin disinformation outlets, which suggest that wearing Ukrainian folk costumes equates to killing 49 people in a mosque. 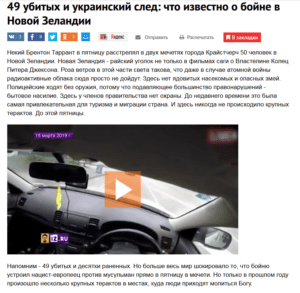 “It is the same psychological profile,” claim “experts” on Russian state TV. Russia’s largest TV-channel even suggests that the attack was the work of US special forces, to distract attention from a looming trade war between the United States and China. The Christchurch shooter made an effort to maximize the distribution of the video from the attack. The New Zealand authorities have done all in their powers to erase the video, out of respect to the victims, and for the case of the criminal investigation. International media has also avoided spreading the video and the shooter’s deluded manifesto, and the largest social media organizations have taken measures to remove the video from their platforms. Russian pro-Kremlin media act differently. The Moscow-based national broadcaster REN-TV publishes the video with comments from a former officer of the Russian special forces, reviewing and evaluating the tactical maneuvers of the shooter. In this case, we are not sharing a link to the source. We do not want to take part in the shooter’s vision of mass distribution of his message. A screenshot from the site below. Following the New Zealand shooting, we have observed how Kremlin media addresses a tragedy like the Christchurch terror attack, attempting to spin it for their own benefit, and we have observed the fifth anniversary of Kremlin deception, disinformation, and dishonesty on Crimea. A wooden anniversary, not of a wedding, but an assault.